Just once, to see the kids' reactions - then you can go back to hitting something they can actually return. The fitness center's ready whenever you are. Dining table doubles as Jenga HQ. Who's in? You're an 8 minute drive from Villas of Grand Cypress Orlando Golf Course & a 10 minute drive from Disney's Lake Buena Vista Golf Course. Your kids will love the pool, it has a slide and a water volcano. 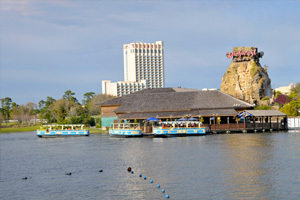 Cypress Pointe Resort by Diamond Resorts is conveniently located near the best theme parks in Orlando. Pastel buildings and Caribbean-style architecture give Cypress Pointe Resort an island vibe that invites you to kick back and relax, umbrella drink in hand. After getting settled into your condo, change into swimsuits, grab pool toys and water wings and slather everyone with SPF. Wind your way through the lush, tropical landscaping, arriving at the gasp-worthy wonderland of a pool with a water volcano and three-chute slide, sure to be the highlight of the kids’ trip. They will also love the playground and the game room. When you get a chance, squeeze in a game on the basketball, tennis or beach volleyball courts or a quick run at the fitness center. Spacious floor plans where 2- or 3-bedroom condos sleep six to eight guests and have plenty of room for the kids along with their games, toys and stuffed animals. Fully equipped kitchens have everything you need to make everyone’s favorites and Winn-Dixie is within walking distance of the resort, making stocking the kitchen breeze. Recruit the kids to help bake your famous chocolate-chip cookies – not that they’ll need convincing. Don’t worry if the kids end up covered in chocolate, that’s what the in-suite washer/dryer is for. When the cookies are done, pop in a movie on the DVD player (rentals are available at the resort) and get the kids settled on the couch. While the movie is playing, take advantage of the in-suite jetted tub for a relaxing soak. You deserve it – you’re on vacation! Gather the shopaholics in your crew and get ready for some hard-core shopping at Disney Springs. It features a variety of shopping that ranges from souvenirs and toys to high-end brands. When it’s time for lunch, there is no shortage of food options to choose from. The four theme parks and two water parks of Walt Disney World® Resort are less than eleven miles from the Cypress Pointe Resort. The World Showcase® at Epcot® features food from eleven countries, or go on a virtual journey at Soarin’® Around the World. Go on a safari, ride Expedition Everest® or visit Pandora – The World of Avatar® (new as of May 2017) at Animal Kingdom®. Ride the Seven Dwarfs Mine Train® at New Fantasyland® in the Magic Kingdom®. Hollywood Studios® is home to The Twilight Zone’s Tower of Terror®, The Great Movie Ride® and Toy Story Mania®.